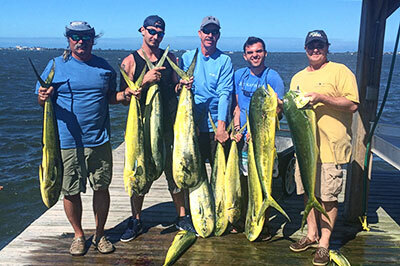 One of the most sought after game fish in the world because of its excellent table fare, Mahi-Mahi are prolific to the waters off of the St. Lucie Inlet in Stuart Florida during the months of November through June. During the Winter months Dolphin migrate South down Florida’s east coast from the Carolinas and provide excellent action while you are catching some Sailfish. 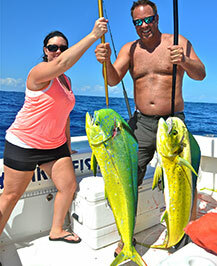 Winter months provide a great opportunity to fill your cooler with great eating fish. The fish during the Winter average around 10lbs with big fish being around 20lbs. Locally the big fish show up in April and are pushing back up North along the Gulf Stream through early June. The average weight of the Dolphin jumps to 20lbs with a lot of fish in the 30+ pound range. If it’s big dolphin you want to catch then April and May is the best time of year to book your fishing trip here. Multiple fish in excess of 50 and 60lbs are caught every year charter fishing out of the St. Lucie Inlet in Stuart Florida. 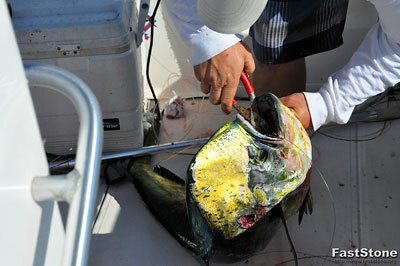 We troll dead Ballyhoo, small lures and suspend live bait from kites to target dolphin. All are extremely effective methods. Dolphin are one of the prettiest fish we catch with brilliant yellows, green, blues, silvers and golds all seen during their amazing aerial displays. They are extremely aggressive sometimes eating multiple baits, they are a schooling fish and it's not uncommon to have 20 plus fish swimming around the boat at one time in the heat of the migration. 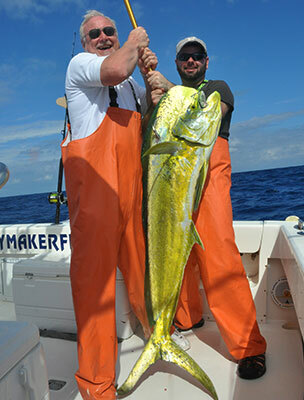 All these characteristics make Dolphin (Mahi-Mahi) one of the most desired targets of our clients. By-catches while fishing for Dolphin include, but are not limited to, Sailfish, Blackfin Tuna, Kingfish, Bonito, Wahoo, Barracuda, Shark and Marlin. 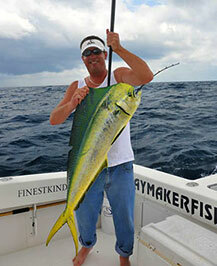 Land some big Dolphin and enjoy some delicious eating fish. Book your trip by calling Capt. Pat on (772) 405-0091 or use our contact form.